Contexts and Dependency Injection (CDI), specified by JSR-299, is an integral part of Java EE 6 and provides an architecture that allows Java EE components such as servlets, enterprise beans, and JavaBeans to exist within the lifecycle of an application with well-defined scopes. 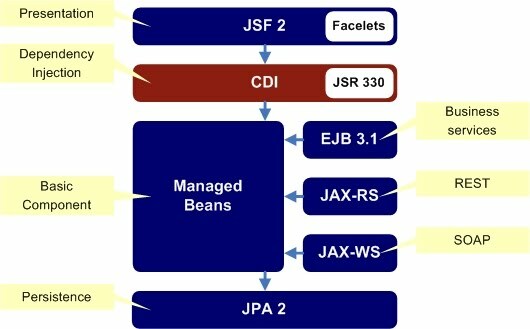 In addition, CDI services allow Java EE components such as EJB session beans and JavaServer Faces (JSF) managed beans to be injected and to interact in a loosely coupled way by firing and observing events. When the application is deployed, the presence of a beans.xml file signals that the module contains CDI managed beans, so the classes on the path are scanned for CDI annotations. In a CDI module, all beans are registered with Weld, and the @Named annotation is used to match beans to injection points. You can also try using the @Stateful annotation. Alternatively, you could try the new @Singleton annotation for singleton instances. If you do, you may notice that there is are two annotations: javax.ejb.Singleton and javax.inject.Singleton. Why two singletons? The CDI singleton (javax.inject.Singleton) lets you define a singleton instance outside of EJB in case you are using CDI in a non-EJB environment. The EJB singleton (javax.ejb.Singleton) provides all the features of an EJB such as transaction management. Therefore, you have the choice depending on your needs and whether you are working in an EJB environment.